shanghai bike polo: how do you play bike polo? i realize that this blog will be visited by more chinese speaking people than english speaking, but since i lack the ability to actually write in chinese i hope that somehow the interested individuals can figure out how to read the information or have it translated. my appologies WAY in advance . . maybe once i find someone who can write perfect chinese and is interested in playing then i can get the chinese version up and running. anyways, a popular question that has been raised when i approach people is : how do you play bike polo? 1. Two teams of three players play in an enclosed rectangular area. Cones are placed at each long end of the rectangle and serve as goalposts. 2. At the beginning of the game, the ball is placed in the middle of the court and the players wait behind their own goals. Following a countdown, both teams charge the ball. 3. A player may hit the ball in two ways: a "shot" or a "shuffle". A shot is made with either end of the mallet head whereas a shuffle is made with the side. In order to score a goal, a player must hit the ball into the opposing team's goal with a shot; if the player uses a shuffle, the goal does not count and play continues. 4. Following a goal, the scoring team returns to their own half of the court. After the scoring team returns to their half, the scored-on team may cross the half line and resume play. 1. A player who "dabs" (touches the ground with their foot) must undertake some form of remedial penalty before making contact with the ball again. This usually involves either riding in a circle or "tapping out" (riding to a designated point on the court and touching it with the mallet). 2. The amount of contact in a particular game may vary but is generally restricted to "mallet on mallet, bike on bike, player on player". Additionally, players are not allowed to t-bone other players' bicycles. 3. 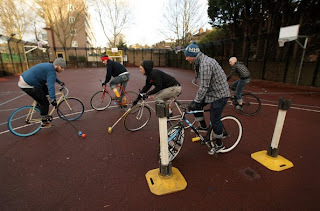 As an decentralized and organically growing game, the rules and styles of Hardcourt Bike Polo may vary substantially from city to city - you bet it! i'm sure we will develop our own set of manipulated rules here in shanghai. so that is the basic premis of how to play . . sound simple enough? Labels: bike polo rules, how do you play? You should probably check some of the recent hard court polo tournaments in the U.S. for rules. The 'official' bike polo rules are for grass polo, and don't represent what we use. I noticed the kids scoring with a 'shuffle' in the vids from Guangzhou. Shooting with the end of the pipe is one of the most important rules. yeah i noticed that too when i checked out the video . .
i'll be sure to make it clear when we play ! and i will definitely check out some of the tourny rules. thanks !